The first casualty of a Mitt Romney presidency? David Axelrod’s world famous Burt-Reynolds-mega-‘stache. The Democratic advisor is so confident about Obama’s chances in Pennsylvania, Michigan, and Minnesota, Axelrod has promised that if the president loses any of those states, he will go on Morning Joe and shave off his “treasured mustache” (and, fun fact: BEST FRIEND). Morning Joe host Joe Scarborough, a former Republican congressman from Florida, said he will grow a mustache if Obama carries either Florida or North Carolina. In his session with reporters, Axelrod expressed confidence about other swing states — but not to the point of risking any facial hair. “I can only bet my mustache once, but I’m very confident at the end of the day we’ll win Virginia,” he said. See? 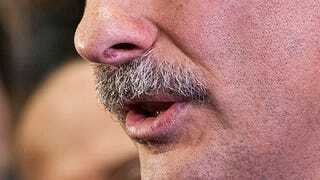 That’s the problem with ho-hum business-as-usual politics these days: NOT ENOUGH MUSTACHE COMEDY. I’d like to add that, as far as ridiculous election-season gift bags go, I’d take the pelt of Axelrod’s lustrous hairy lip-worm over Donald Trump’s 5 million garbage-dollars any day.